My hunger for love stories is insatiable, and the moment I come to know about a new book that revolves along the complexities of love, friendships and relationships, I pick it up from my library. The Indian publishing industry is now witnessing a huge boom, with bloggers turning out to be brilliant authors. Then there are also people who wish to take the path less travelled, they quit their high profile jobs and have found their passion in writing and art. A decision to make a career switch is not that easy and I am quite overwhelmed when I hear of such people. Sid Bahri is one such person. A hotelier by education, an ex-banker and a senior executive in the outsourcing industry, Sid gave up his career to follow his passions. He is an avid blogger and loves ‘Cooking’ stories. ‘The Homing Pigeons’ is his first book. The cover of the book is eye-catchy and soothing. This left me with many questions, the answers to which I found at the end of the book. One unique thing that I noticed in the book was the way the chapters unfolded. There were no chapter titles. Instead the author portrayed the view points and the emotional upheaval of the protagonists Aditya and Radhika. The story revolves around their lives, their confused and tangled emotions, be it love, lust or friendship. I bet you would not want to keep the book down, until you finish it, the reason being the different viewpoints. A particular situation narrated by Aditya, is then recounted by Radhika. I found this very interesting and quite challenging as well, as the opinions and reactions of a man are completely different from that of a woman. I could relate to many situations and also to the characters, especially Radhika. We women tend to give in many times, we sacrifice for the ones we love, however we seldom think, if that sacrifice was worth doing. One more fascinating character is Divya, she steals the show with her extreme boldness and blunt attitude. ‘The Homing Pigeons’ is a love story, however, it’s something completely different, yet so relatable. After all, ‘not all love stories are perfect, but then, neither are people’. The story will surely drain you emotionally, keep you hooked and leave you wondering about the different aspects of relationships. “You can’t expect affection if you’ve only done something out of a sense of duty”, this particular line, has made a mark on my heart forever! 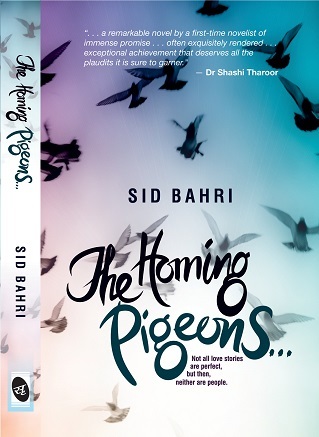 Sid Bahri is here to fly and soar high! ← What shall I write…? Do pick it, I am sure you will love it! Thank you for your review. Just chanced upon it in a random search on google. There is no greater pleasure for an author to hear a readers perspective. I am grateful that you chose to write your review.